I started this tradition which is not really a tradition three years ago where I email my mother a few questions and pester her to answer there. I forgot to do it last year but it’s back again this year and that same mother is now a grandmother. If you read the interview in my last post, you will have already understood the story of Jane and Sidney adopting Jacob and being smitten by him in the process. This year’s interview is less about Jackie being our mother and more about being JFC’s beautiful grandma. The torch has been passed and I feel thrilled to say that that collectively, this boy will never want for love as long as he sticks around the D’Souzas and Cardosos. 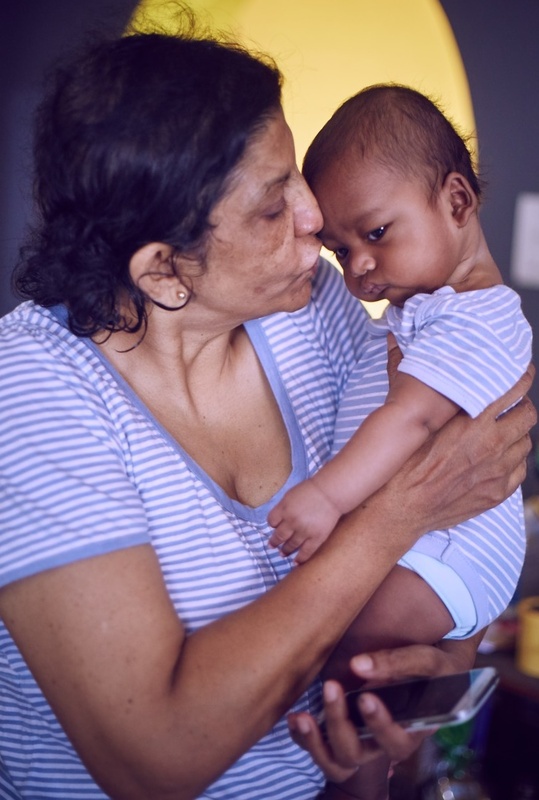 These days, my mother spends her time secretly and bravely fighting a chronic condition, living with my father and scheming ways to hangout with grandbaby while working full-time at the bank. She has taught us so much with her patience and has always been cheering us on in her own quiet way. None us really know how much time we have together (learnt that first hand with my grandma) but I know we’ll be okay if we can try to be the best of her. It brings me great pleasure to share with you the “Third Interview with Mama” on EGD.com (you can read the 1st and 2nd here). Please also enjoy the recipe I used to bribe my mother with at the end. Happy Mother’s Day to all you mama birds/bird figures. You choose to take on this mammoth role of child-rearing with such grace. To those who have lost and who never had, your resilience and kindness despite the odds are a testament to their lives. I love you mama(s)! On a scale of 1 to 10, how excited you are to be called grandma? 11. I love telling people that I am one though. Actually, you’re not being called that yet but if you were, do you prefer grandma, nana, nanu, grand-mama, marmalade or something else? Let’s just let the little man decide what he wants to call me. I am curious to know what he will come up with. How different is it being a grandma over being a mother? I guess it’s about not being around him 24×7 and having to take decisions on his behalf. Do you feel a little rusty caring for a baby after so long? Yes I am surely rusty, but Jane makes it seem so easy caring for this little jewel of a chap. Plus, times are different, so yes. But I am getting the hang of it. How good weird for you to see your first born child manage her own baby’s needs? How does it make you feel? Like I said, Jane is doing a great job being a mother. I feel good to just take the back seat. I am there whenever she needs me, but she is managing just great and no words can express the pride I feel. Did you expect Jacob to make you feel as positive as he has? Or did you have no expectations…it’s okay if you didn’t. It was a wait and watch time for me, but he stole my heart from the moment I set eyes on him. I have the image in my mind and it always tears me up just thinking of the moment I set eyes on him. Is Jane your favourite daughter now? What were your biggest hopes, dreams, aspirations and fears when you had your first child? Did you have certain expectations of how motherhood was supposed to be based on how you were raised? I can’t remember that far back, but it was just taking care of day-to-day things – worrying when she was sick but God had been good and gave me a good baby. I really don’t know the answer to this, but I guess just taking care of needs and making sure we could provide in the best way we could. Did you feel better prepared for your second and third child? Maybe. But each one was special and different in their own way. How important is it according to you to have an equal parenting partner when you have your own kids? It does make a world of a difference to share responsibilities because kids know how to get their way with the weaker parent. That’s what a family is all about – sharing and caring. Was it ever difficult for you to go to work when you had young kids or did it feel like something that gave your life purpose? I was young and felt that I could juggle work and home and besides, we needed finance to bring home the bacon. Since I was in the banking sector it meant stability. The close proximity of my work place made it easier. I did get time to spend time with my kids, so it was okay. How are you able to still provide good customer service at work even when you’re having a bad day? “KISS” – Keeping It Simple Silly. Basically, nowadays everyone in in a hurry. So it’s best to do what they want and send them on their way. Or just direct them to the higher-up authority. Do you still enjoy working now or are you ready to retire? Up to a point, I like my job (I don’t know anything else), but as one gets older I do look forward to retiring. I have already put in more than half my life, so I would think about retiring. If you do retire, what do you plan on doing with your free time? I would like to travel as there are no commitments to get back to work, health permitting. I now have Jacob, so would love to spend time with him too. You have this annoying medical condition that zaps your energy and sometimes worse. How do you manage to stay positive and keep your zest for life? Does it ever scare you? Because it surely scares us! Honestly, it scares the hell out of me too but after I am out of it I get depressed. But I have to pull up my socks and get on with life. The sun doesn’t stop rising day after day, so I have to get on. It does sap my energy, but it’s my life, and I have to make the effort. Knowing that my family is rooting for me, keeps me going. I also meet people who keep telling me that they have been praying for me, and that gives me a boost as well. Do you have any words of advice for a person newly entering their 30s? How does it feel to have two 30-yr-old children?! I’m already 30 in my mind. I can only think of you as my daughters – you will always be young. Just makes me feel older. You have achieved so much in 30 years, strive to achieve more. What’s your current favourite thing apart from Netflix? I enjoy my short chats with you and Gayle. And the new love of my life, Jacob. He is just adorable. Wish you both could be here to watch him. How does it feel having two children not living close to home on a made-up holiday for mothers? I miss you both dearly, even though WhatsApp and Facetime don’t make it feel like you are far away. It’s not only on Mother’s Day – it’s just a day – but always. Wish America and Spain were not so far away. Last question: Should every day be Mother’s Day? Every day is Mother’s Day – one can never stop feeling like a mother even though one has grown up kids. Their problems always weigh on her mind and she will always worry about her kids no matter what. At least I do. My younger sister Gayle and I, video chatted on WhatsApp this week and I showed her my new cookbook. She’s a chef-in-training so I told her she would like it. She already knew she wanted it after doing her own research while on an internship in Spain. 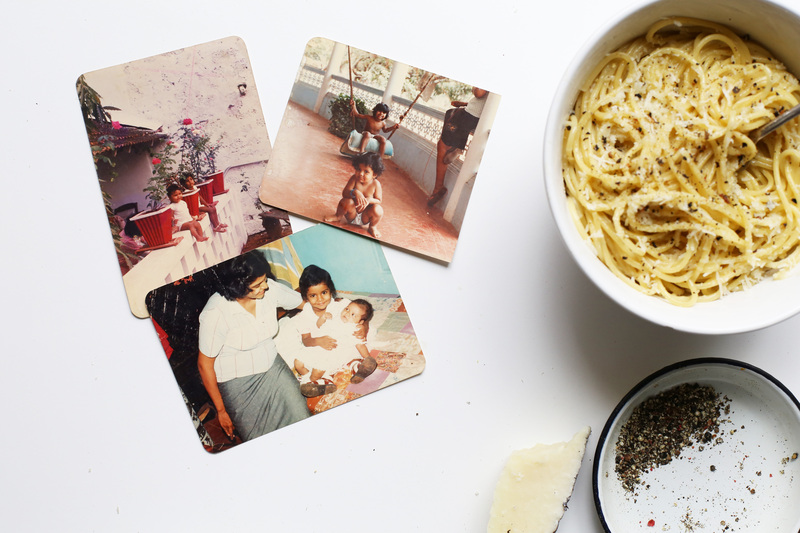 In honour of my mother’s love for pasta (and the fact that I bribed her), I knew I wanted to make her a recipe from my new favourite Salt Fat Acid Heat by Samin Nosrat with the most wonderful illustrations by Wendy MacNaughton. I buy cookbooks very sparingly (or not at all). It has to be a book I use everyday and go back to constantly for inspiration. This is definitely one of those books. Of late, I have been trying to better understand what makes certain foods go well together. This book answers most of those questions with clarity and no judgement. I came out feeling encouraged. Simply reading the first chapter has already changed the way I think about salt. In fact, I even sent my mother a recipe for pesto from its pages (I’ll never make pesto any other way). Wish I could be sharing a bowl of this with her. 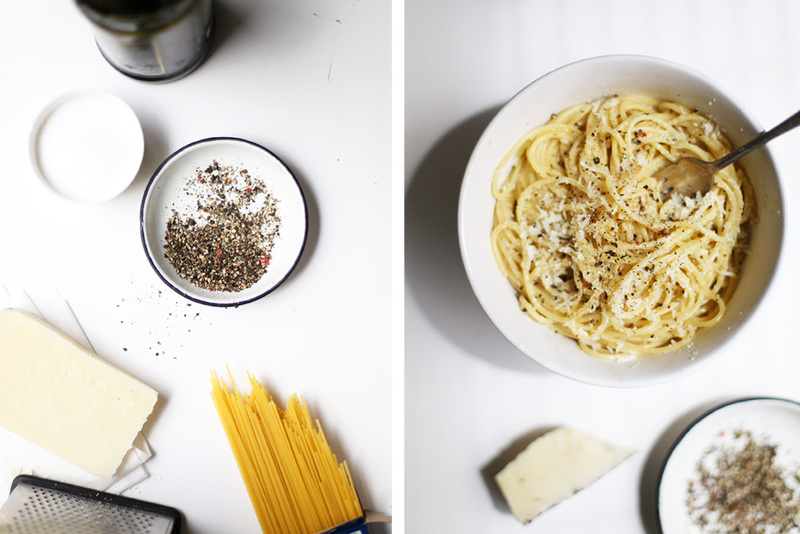 Apart from pasta being mama’s favourite, this recipe gave me a chance to use my newly-gained water salting confidence (it’s a thing). I’ve never aimed for water that tastes like the sea and if you have any questions about that, feel free to comment or email me and I’ll tell you what I interpreted from the book. 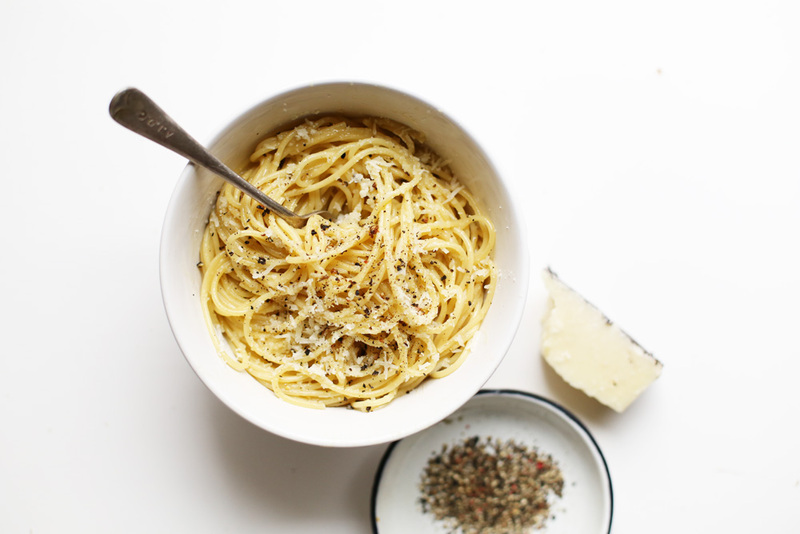 Cacio e pepe is the Roman (and, dare I say, better) answer to macaroni and cheese. It’s traditionally made with pecorino Romano, a salty sheep’s milk cheese and abundant black pepper. Take a few measures to prevent the sauce from clumping: first, use the finest grater you have to grate the cheese so it can melt readily. Next, encourage an emulsion in the pan by swirling together the pepper, oil and starchy pasta water until it comes together. And finally, if your pan isn’t roomy enough to toss the pasta, place everything in a big bowl and toss with tongs, adding a little pasta cooking water at a time, until the sauce comes together. 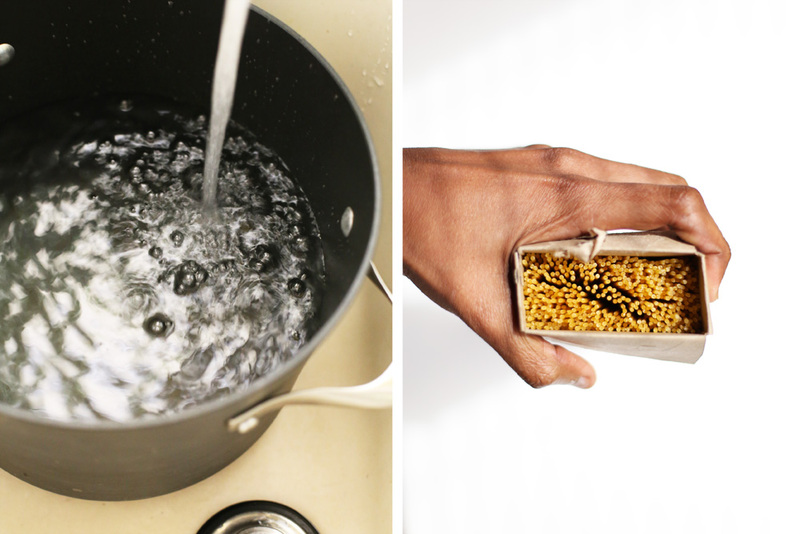 Set a large pot of water over high heat and bring to a boil. Season generously with salt until it tastes like the summer sea. Add the pasta and cook, stirring occasionally, until al dente. Reserve 2 cups of the cooking water as you drain the pasta. In the meantime, heat a large pan over medium heat and add enough olive oil to just coat the bottom. When it shimmers (which means it’s hot enough), add the pepper and cook until fragrant, about 20 seconds. Add 3/5 cup of the pasta cooking water into the pan and let it boil – this will encourage an emulsion to form. You can also swirl it around as it’s boiling to help the process. Add the drained pasta to the hot pan and toss to coat the noodles, then sprinkle in all but a handful of the cheese. Use tongs to vigorously toss the pasta, adding more pasta water as needed to create a creamy sauce that clings to the pasta without clumping. Taste and adjust salt as needed. Garnish with remaining cheese and more coarsely ground pepper and serve immediately. Previous Post: « Interview with Jane on her first Mother’s Day!